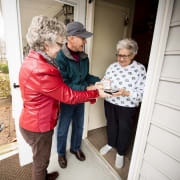 Volunteers are needed to deliver hot, nutritious meals to the homebound elderly in Forsyth County. The meals are delivered between 10:00 a.m. and 1:00 p.m. Monday through Friday. Volunteers deliver in a designated geographical area and a route generally takes 1.5 hours to complete. Volunteers can deliver once a week, once a month, or anything in between. A volunteer orientation is provided and written directions to each address are furnished. Please complete a volunteer application online. More opportunities with Senior Services, Inc.